Today's challenge at One Stitch At A Time is "Re-use or Re-Cycle". You must re-use or recycle something on your card. Easy peasy, eh? I decided to reuse some twill tape. It's that orange ribbon on the side. It came in some packaging--can't remember where I got it--but I always save that ribbon to reuse again. Today it came in handy. I used a stamp called Sweet Something. Isn't she delish?!!! Love her pose. She's colored with copics and I've used the Mojo Monday sketch from last week as a starting point. and the prize is 3 Promarkers! Awesome! Make sure you check out all the DT's work over at the challenge blog. It's fabulous! She is beautiful. The colors are is bright and cheerful. OH WOW ... this is fabulous and GREAT coloring! Thanks so much for joining us at The Sisterhood ‘USING DIGIS’ challenge and please come back again soon! Great minds think alike...lol I even save gems that fall of the kiddos toys... Love this image and your bright colors! 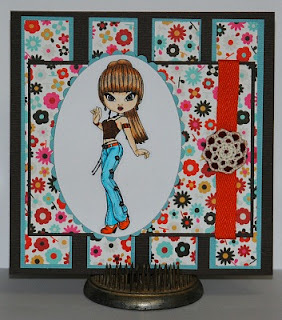 Beautiful card - I love that paper - so bright and cheerful, and it contrasts so well with the darker background. Your card is delightful! Your artistry is superb. What a sassy image! I love the colours! Thanks for joining us this week at The Crazy Challenge! I save my ribbons and tape too,love the card and the colours are perfect for the image as well. An absolutely wonderful creation full of beautiful attention to detail. Thankyou for joining us on Simon Says Stamp Challenge Blog this week. Gorgeous image and love the DP. Thank you for joining in with us at Dream Valley challenges. Hugs Eva. Love the bright colourful paper and the twill was a good save, things always come in handy don't they?